A. 3 ¼” frame with 1 ½” brickmould & bullnose sill brickmould. B. 3 ¼” frame with vinly jamb extension & 2 ¾” interior molding. C. 3 ¼” frame with brickmould & vinyl jamb extension. D. 3 ¼” frame with nailing fin & vinyl jamb extension. 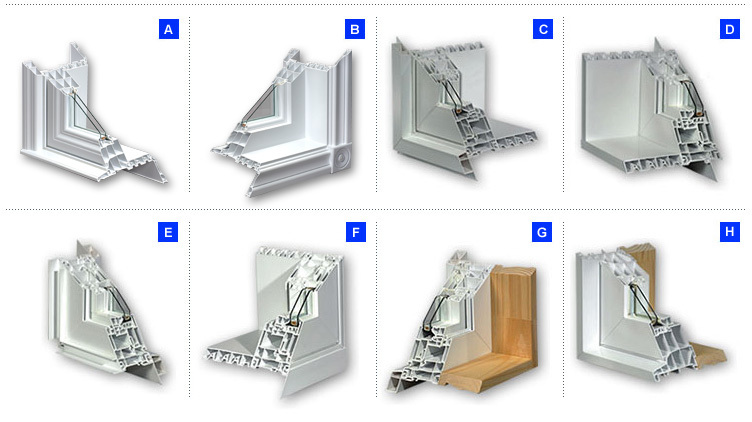 E. 3 ¼” frame with brickmould & drywall return. F. 3 ¼” frame with sill expander & vinyl jamb extension. G. 3 ¼” frame with brickmould & wood jamb extension. H. 4 ½” frame with wood jamb extension.